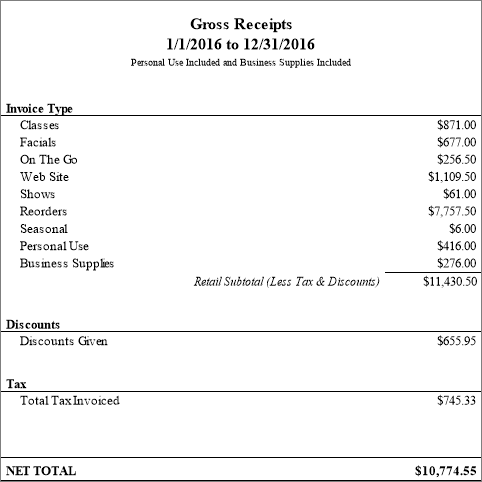 An additional Gross Receipts report has been added with a new visual format, and options. The new report is based on invoices entered into Boulevard and gives the option to include or omit personal use or business supply invoices. The report will also display discounts given and total tax invoiced. Important Note: The new Gross Receipts report is based only on invoices, not on the entries from the Weekly Accomplishment Sheet (the Annual Gross Receipts report is based on the Weekly Accomplishment Sheet). From the Shortcuts form, click Reports (or from the Business Tools menu, select Reports). Under the newly created Tax section, double click to open the Gross Receipts report. Enter Start and End dates or choose Quick Dates, then click OK .
From the Filter side bar, if desired choose to omit Personal Use or Business Supplies, then click Submit . From the preview toolbar click to print.